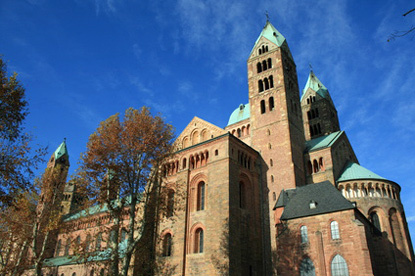 Dominated by its Romanesque cathedral, Speyer is one of Germany's oldest cities and the resting place of eight medieval emperors and kings of the Salian, Staufer and Habsburg dynasties. Speyer was the seat of the Imperial Chamber Court between 1527 and 1689, and also held 50 sessions of the Imperial Diet. The First Diet of Speyer (1526) decreed toleration of Lutheran teaching, soon revoked by the Second Diet of Speyer (1529). The latter diet led to the Protestation at Speyer the same year, during which 6 princes and 14 Imperial Free Cities protested against the anti-Reformation resolutions. It is from this event that the term 'Protestantism' was coined. The Imperial Cathedral Basilica of the Assumption and St Stephen, as it is officially known, is the largest and most magnificent of the three Imperial Cathedrals (Kaiserdom, the two others being Mainz and Worms). Emperor Conrad II started its construction in 1030 on the site of a former basilica. It was consecrated in 1061. 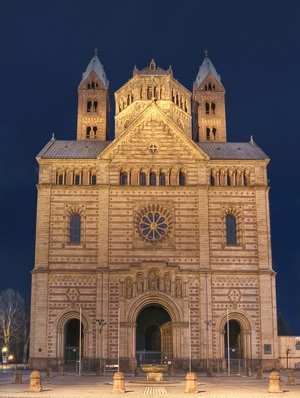 With a length of 134 metres and a width of 43 metres, Speyer Cathedral is one of Europe's largest Romanesque churches, along with Santiago de Compostela in Spain, Cluny Abbey in France, and Durham Cathedral in England, which were all build later, towards the end of the 11th century. The cathedral was added to the UNESCO World Heritage List in 1981.
the Golden Hat of Schifferstadt, a large thimble-shaped artefact from the Bronze Age covered with sheets of gold. the oldest unopened wine bottle in the world (dating from the 3rd century) in the Wine Museum subsection. the episcopal treasury recovered from the cathedral in the 20th century. It includes medieval relics from Holy Roman Emperors. The Technik Museum Speyer is a huge transportation museum, sporting a vast collection of old cars and motorbikes, fire engines, locomotives, aircrafts and ships. The most impressive exhibits include a U9 submarine, an Antonov AN-22 cargo plane, a Boeing 747 Jumbo Jet, and even a space shuttle ! The adjacent IMAX DOME cinema will take you on journeys around the world on a giant screen in 3D. The museum is open all year-round from 9:00 am to 6:00 pm (until 7:00 pm on weekends). Admission to the Technik Museum is 14 € for adults and 12 € for children from 6 to 14 years old (free under 6). Tickets to the IMAX DOME Cinema cost 10 € for adults and 7.5 € for children (not free under 6). Combined tickets cost respectively 18 €, 14 € (6 to 14 years old) and 7.5 € (under 6). Altpörtel (Old Gate) : one of the 68 original towers and gates in the city walls. 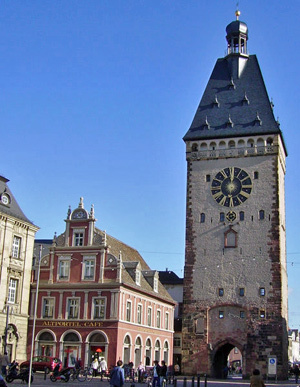 Built between 1230 and 1250, this 55m tall clock tower is one of the largest surviving city gates in Germany. Rathaus (Town Hall) : a red baroque building with a sumptuous rococo interior. Alte Münze (Old Mint) : a white and reddish baroque building on the market square (Maximilianstraße, 90). Sealife Speyer : an aquarium focusing on fishes from the Rhine River, from its source to the North Sea. Speyer is located 20 km west of Heidelberg, 20 km south of Mannheim and 40 km north of Karlsruhe. There are direct trains to Worms from Mannheim (25min), Heidelberg (45min) and Mainz (1 hour). Trains from Cologne, Frankfurt or Stuttgart require a change at Mannheim.